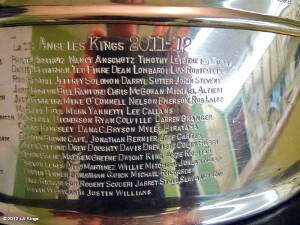 From Altieri through Westgarth, the 2011-12 Los Angeles Kings and their improbable, lightning-in-a-bottle championship team are now formally and forever engraved onto Lord Stanley’s Cup. And then some. Although the limit is technically 52, the league added co-owner Ed Roski’s name on the far right of the top line, after owner Philip Anschutz, his wife Nancy Anschutz (surprisingly, their dog was snubbed) and team governor Timothy Leiweke. Why Roski’s name was left off the initial list has yet to be explained, but according to Helen Elliott of the Los Angeles Times, the league determined it was too important to omit. Interestingly, Andrei Loktionov and his 38 regular season (along with two postseason) games was left off. The criteria for selection isn’t completely known, but Loktionov played in five more games than Davis Drewiske and Kevin Westgarth — combined. However, both Drewiske and Westgarth were on the roster the entire year, likely the tipping point to a permanent spot on hockey’s holy grail. -The raising of the championship banner is scheduled for October 12th, prior to their game with the New York Rangers. However, with little progress having been made with respect to the labor dispute, cancellation of that game (and others, of course) is a virtual certainty at this point. -Anze Kopitar became the first high-profile NHL name to join the Swedish league HockeyAllsvenskan, joining his brother Gasper on Mora IK. -Dustin Brown has offers to play in Switzerland’s top league as well as the KHL. 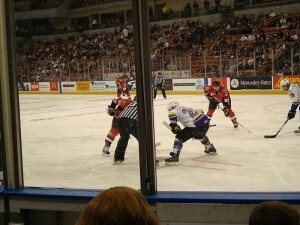 -The Kings’ AHL affiliate Manchester Monarchs opened training camp on Saturday. Manchester finished second in the Atlantic division with a 39-32-2 record (83 points) before falling in the first round of the Calder Cup playoffs.